Kenna Heat Cool Solutions is owned and operated by Tom Kenna. Tom has been a Gurnee IL HVAC industry specialist since 1996. We serve residential and commercial clients with integrity, superior technical knowledge and personal service. We pay attention to the little things and take the time to do it right. I founded Kenna Heat Cool Solutions with my wife Amy in February 2012. I saw a need to go beyond repairs to give clients total comfort and an enjoyable experience. I’ve seen way too many problematic heating and cooling systems installed with no design or engineering. I seen many people suffer with uncomfortable indoor air season after season. I knew I could help people live better. Solving these problems is my passion and fun for me. Yes, I’m an hvac nerd as Amy can attest. 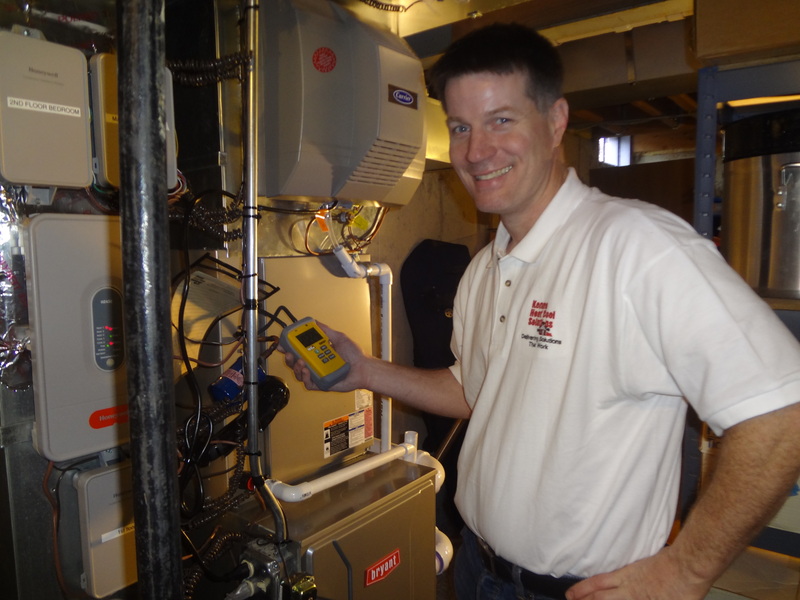 My passion for heating and air conditioning began in 1996 when I was a Service Technician. I found my problem solving skills and ability to connect with people came together for a great experience for clients and myself. People really put their trust in me. I learned a lot about the industry, what works and what needs to be better. I progressed to Lead Technician, Field Supervisor (the guy called in when no one else can fix it), and Sales Engineer. Those “needs to be better” ideas and loyal following inspired me to create a company that listens to clients and delivers solutions that work. I enjoy my work because no job is the same. Individual needs, what’s within the home and available options provide a fascinating problem-solving experience. I love to find out how things work, how they could be better and bring workable solutions to my clients. I enjoy explaining how to get more from your systems. I enjoy giving benefits beyond peoples’ expectations. Solving something clients didn’t even know was fixable gives me great satisfaction. This drives me to continually educate myself. When I work on your equipment, I feel you have entrusted me to do the best job possible. I feel like the equipment is mine and I want to do an exceptional job for you. I observe the complete operation of the equipment. I check the specifications found against manufacturer specifications. I adjust as needed to achieve maximum comfort and efficiency. I enjoy showing you how the system works and telling you simple things you can do to help the product work better. When there is a problem, I first ask you what you have noticed. You are around the equipment 24/7. Noises you’ve heard are clues to help me uncover the reason the part failed. Then I begin to discover the true solution to the problem – not just another “bandage”. I once was told by a client that they saw the excitement in my eyes when they described a problem to me. They knew I had the knowledge and drive to find the solution which other techs were not able to discover, or were unwilling to look. I have a very strong work ethic. I get immersed with the challenges I face. I have never found a machine yet to beat me. Some may have been a 15 round fight but in the end I have always been victorious. Solid industry experience since 1996 including extensive HVAC certification, training and ongoing education. He listens and is always honest, building strong rapport and credibility; He treats your place like it’s his own. Immense technical knowledge and problem solving ability. He has a reputation for solving technical riddles many others have tried and failed. NATE (North American Technician of Excellence): Certified in Core Standard; Air Conditioning; Furnaces; Air Distribution & Movement; Heat Pumps. NATE is a continuing education forum that has prescribed standards which are recognized by the entire HVAC industry. Technicians who pass their tests have a higher level of knowledge and training. EPA Universal 608 Certification: Certified to work on all types and sizes of refrigerant. Certified DET Verifier (Duct Envelope and Tightness): Illinois code requires all duct work installed on new homes or modified in existing ones must be verified for leakage by a licensed verifier. * Because there is no licensing in the industry, anyone with a bucket of tools can open up shop. A worthy contractor should have HVAC certification.